Spanish Chicken and Rice is a multi-step recipe that takes a lot of time but is one of the most delicious recipes ever! The simple and craveable combination of chicken and rice can be made in so many different ways. Try this one, the very definition of wholesome comfort food! Chicken and Rice is having a moment. Whether you make the Spanish staple, Arroz con Pollo or make up your own version, it is soul-satisfying and perfect for the cooler weather. A few weeks ago, I made a version of Arroz con Pollo that a friend remembered from his favorite childhood restaurant. It was green with cilantro and creamy with cheese and sour cream. I made a casserole that combined three recipes, my Green Rice, Poached Chicken and a creamy cheese sauce. All this was topped with buttered breadcrumbs and took me about four hours to make. It was delicious but it was so much work! Even the more traditional Spanish Chicken and Rice is a multi-step recipe that takes a lot of time. In my world, I can make rice on the stovetop and grill chicken thighs in less time with less mess, but that is not what most people think of when they think of Chicken and Rice. Electric pressure cookers are also having a moment. And, until recently, I had never used one. My sister bought one and bragged about making chicken soup in 15 minutes. I thought she was dreaming. or had made a chicken soup so devoid of taste that no one would want to eat it. But all that changed when I got my hands on a pressure cooker. I chose a simple model from Cuisinart that would let me chose between high and low and set the time. As someone new to pressure cookers, I am not going to bake a cake or make yogurt in one of them. 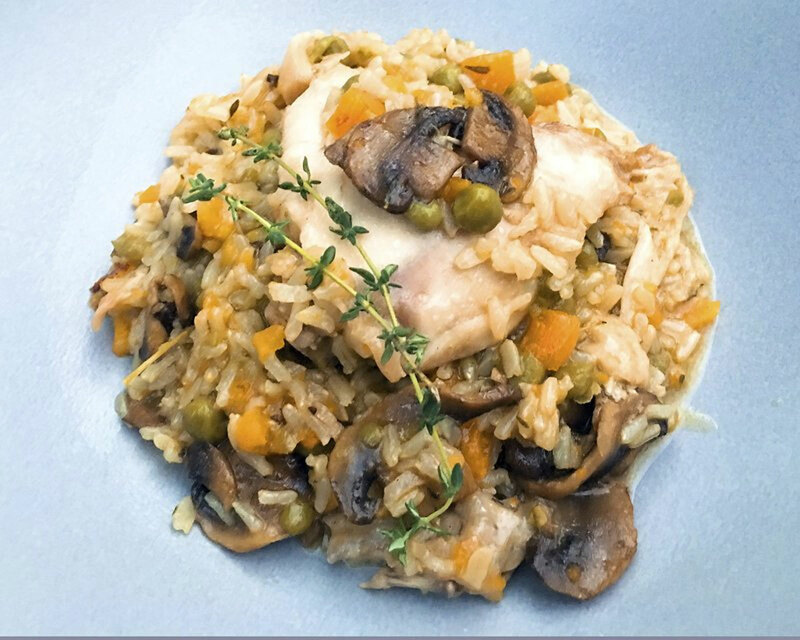 Thinking about the simple and craveable combination of chicken and rice, I experimented with throwing it all in a pressure cooker and seeing what would happen. I didn’t saute onions_or even use them_or brown the chicken which you could certainly do and it would only make it better. I made it by putting everything in the pressure cooker and turning it on. I did stack the flavor deck a little. I used chicken stock and white wine to cook the brown jasmine rice and the chicken. I seasoned the chicken thighs with a spice rub and added it to the liquid, and added unsalted butter for flavor and texture. But I also used a bag of frozen vegetables for convenience. I am partial to lima beans, but I figured that most people would prefer peas and carrots so that is what I used. I had some fresh thyme so I added that to the pot, but if you don’t have it you can use dried thyme. I had a pound of fresh mushrooms that needed cooking so I sliced and sauteed them before putting everything in the pressure cooker_but they could be optional. After 23 minutes, I was rewarded with a surprisingly delicious one-bowl meal that was the very definition of wholesome comfort food. It was bursting with flavor and made me dream of what else I could make in the pressure cooker. With food this good, and this fast, there is no excuse not to cook from scratch. If using mushrooms, saute and set aside. Measure out rice, stock, wine and butter, and place in pressure cooker pot. Meanwhile, mix salt and dried spices together. Season chicken and set aside. Add remaining spice mixture to rice and stock. Stir to mix. Add the mushrooms, if using, and the frozen vegetables and place the chicken on top. Add the sprigs of fresh thyme. Lock the pressure cooker according to manufacturer instructions. Make sure the valve is in the pressure position. Set the pressure on high and set time for 23 minutes. Chef’s Note: The pressure cooker will take about 20 minutes to build pressure. After that, it will begin to time the cooking process so the whole cooking time is 43 minutes. Once the pressure cooker has cooked for 23 minutes, let it release naturally. Open and stir to make sure the rice is done. If it is too al dente, continue cooking on simmer or pressure cook for another 3-4 minutes. The chicken skin will not be brown or crispy. If you want the skin crispy, place in a heat proof serving piece and crisp the skin under the broiler. Nutrition information per serving: 397 calories; 103 calories from fat; 12g fat (6 g saturated; 0 g trans fats); 85 mg cholesterol; 705 mg sodium; 48 g carbohydrate; 6 g fiber; 5 g sugar; 22 g protein. Cooking recipe: Here’s how to make delicious chicken and rice under pressure in a cooker by North Carolina native Elizabeth Karmel, a.k.a. Grill Girl.